When this handmade plat book made its way to me to be scanned, I discovered a very interesting story. It started with the description and metadata creation. In layman’s terms, in case you’re not familiar with “creating metadata,” it means assigning subject terms to an object so you, me and other researchers can find the item when you search the collections, and often through a Google search. 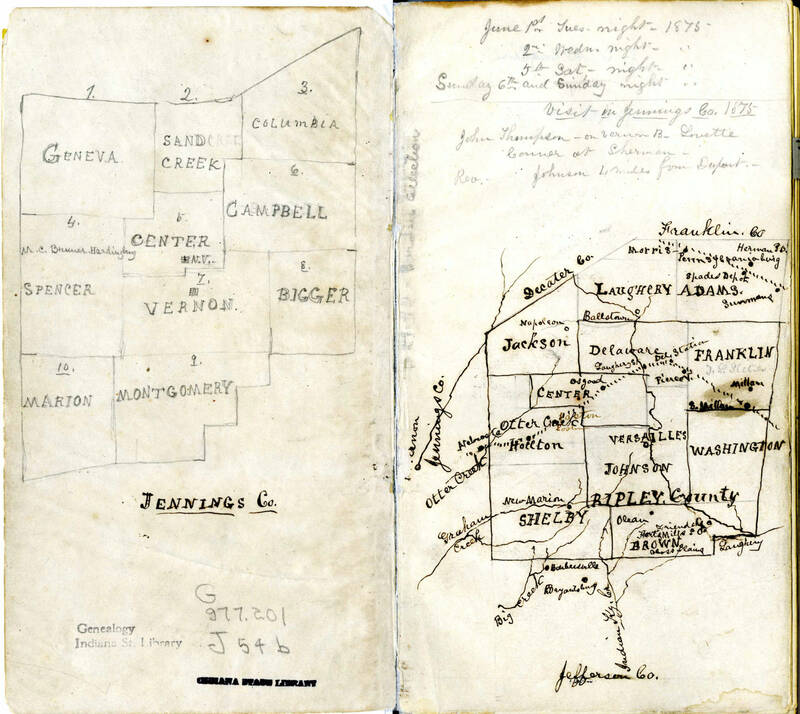 This plat map book shows land ownership in townships in Jennings and Ripley Counties. It was hand-written by William W. Borden of New Providence (now Borden), Indiana, in 1875. 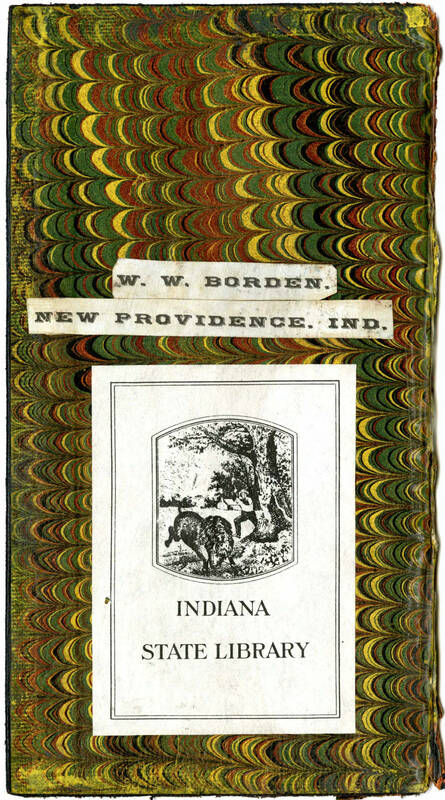 As I looked at the inside of the front cover, I thought “Who is W.W. Borden of New Providence, Indiana?” and even more so “Where is New Providence?” I had no idea. It wasn’t on a map. So, with a quick internet search, I found that New Providence is now called Borden, located in Clark County. From there came a flood of information. William W. Borden was a well-known state geologist, a collector and a curator. In fact, his will specifically directed his heirs to maintain a museum of his collection. Alas, the museum didn’t last and his collection dispersed. Somewhere over time, this handmade plat book made its way to the Genealogy Collection here at the Indian State Library. You can learn more about Borden here. I can imagine Borden, on a horse, wondering the hilly back roads of Jennings and Ripley counties on a summer day drawing up maps showing the locations of rivers, laying out the townships and asking the locals “Who lives there?,” while jotting down the names of the land owners. My theory is that Borden was out learning how to plat maps, studying the geological landscape and collecting local specimens. 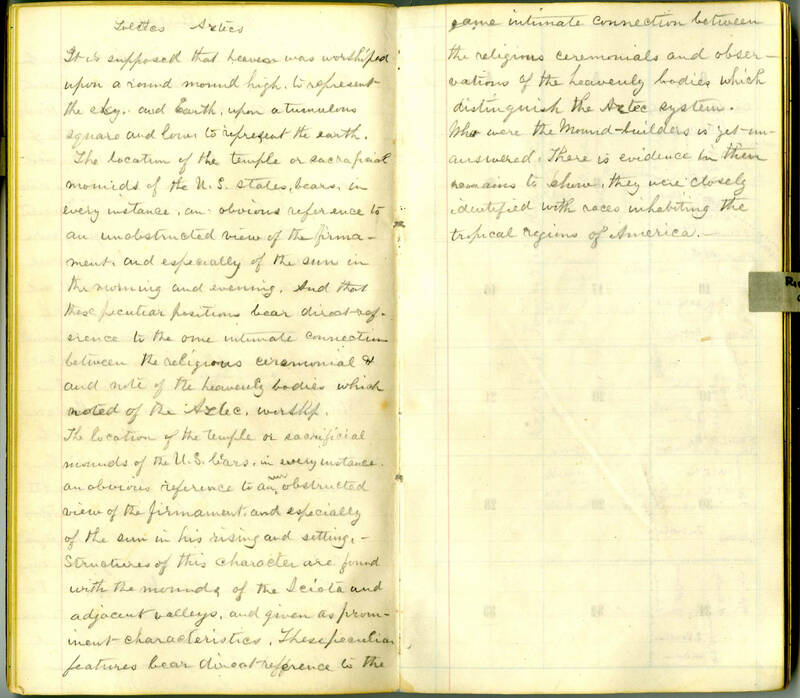 Little did he know that someday his note book would end up being a genealogical resource for researchers. 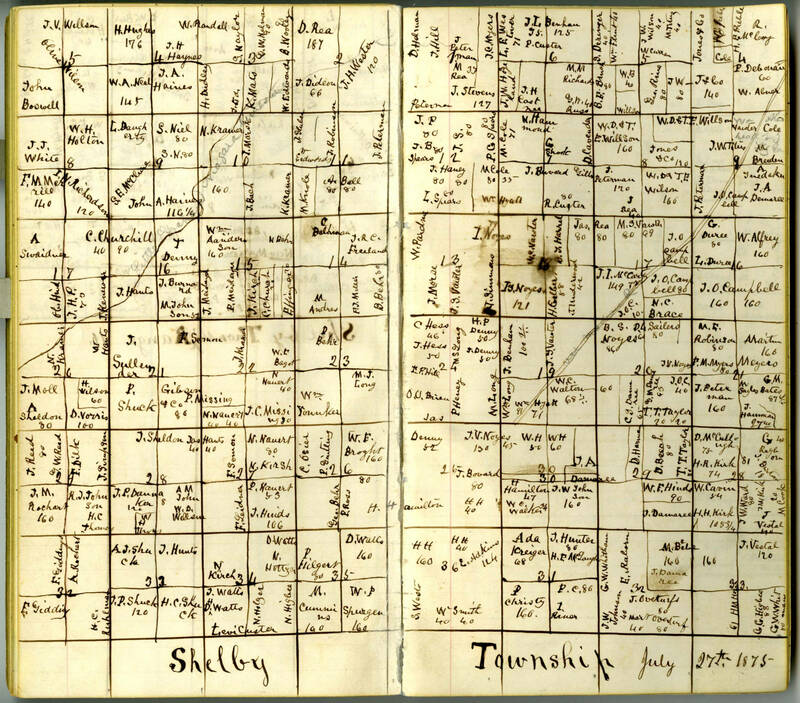 Although probably not complete, each township map shows the owners of the land at a specific point in time – 1875. On a personal note, I had family in Ripley County and even though I still haven’t found them on any of Borden’s maps, I wonder if he rode by and waved. I also can’t help but wonder if he would stop for some lunch under a shady tree and read since there are two sections of notes: One on the Mound Builders and the other on the Aztecs. Regardless, this is one example of the great items waiting to be discovered in the collections at the Indiana State Library. One man’s creation has become a wealth of information for researchers, be it someone studying genealogy, someone wondering how one geologist learned about his surroundings or even someone wanting to study cartography. I’m sure Borden would be pleased. The Indiana State Library’s Digital Map Collection continues to grow and new maps are being added all the time. To see more of our general digital collections, check this out. This blog post was written by Christopher Marshall, digital collections coordinator for the Indiana Division, Indiana State Library. For more information, email Christopher. 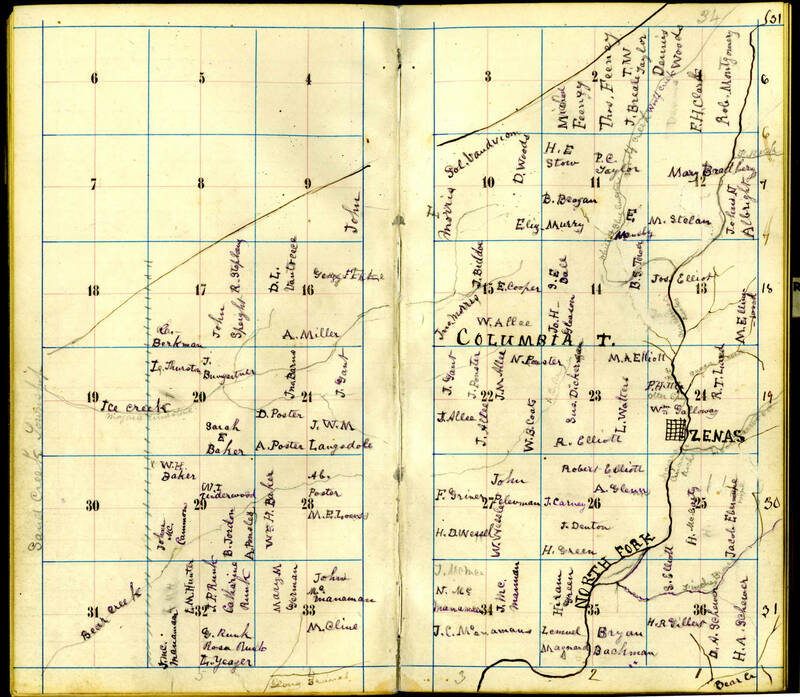 This entry was posted in Indiana Division and tagged borden, clark county, Indiana, Maps, new providence, plat by indianastatelibrary. Bookmark the permalink. Wonderful. Glad to get to view this.